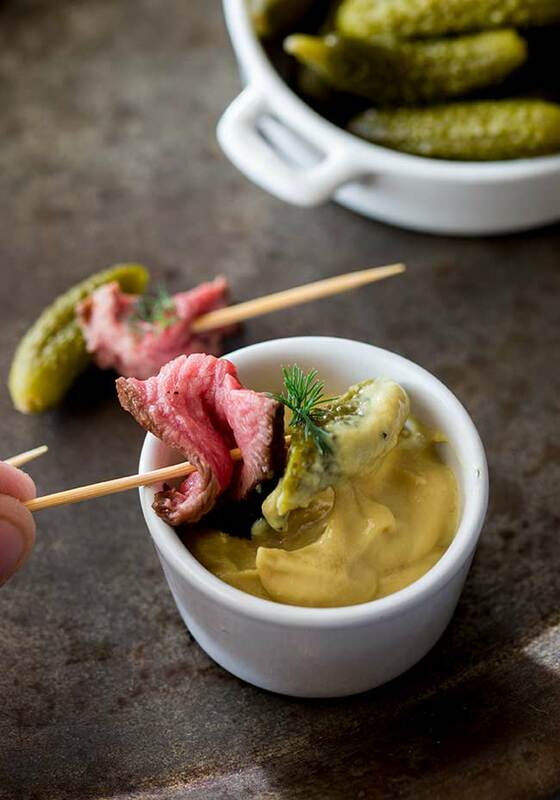 Strips of tender, sweet pickle marinated beef paired with the crunchy of a dill pickle. 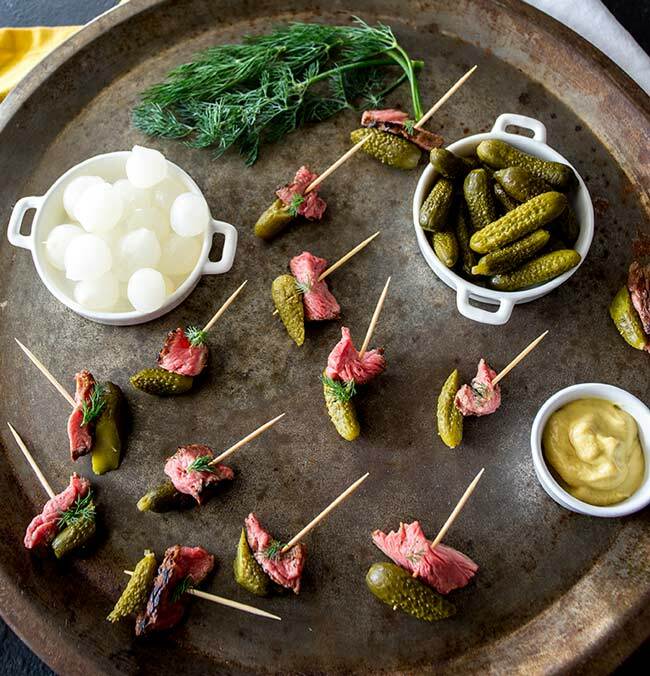 These Dill Pickle Beef Skewers are a delicious and easy party appetizer. Or serve them on game night as a easy to eat snack. The key to this simple appetizer idea is the pickle juice! It is the perfect marinade for the beef. It tenderises the beef, adds sweetness and a hint of salt. And I love the fact that it is something that you would usually throw away. Plus look how beautiful the steak looks even before it has been cooked! What cut of beef to use for beef skewers? 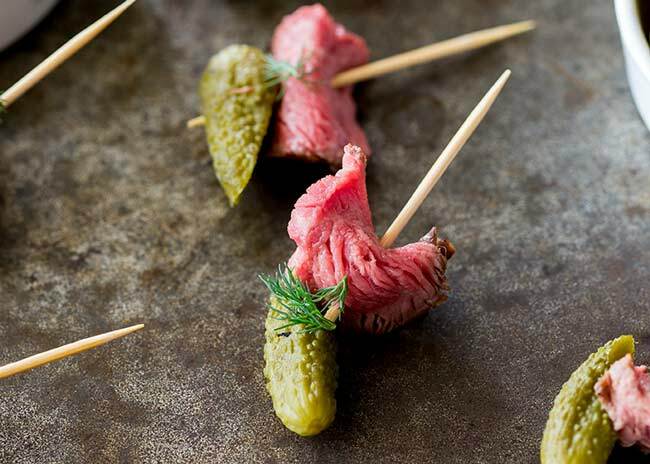 These Dill Pickle Beef Skewers are designed to be eaten in one bite, so the beef used needs to be tender. 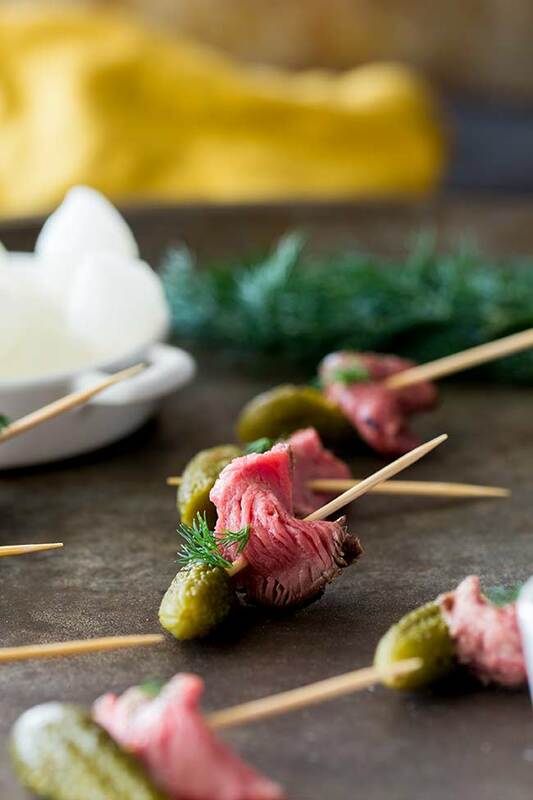 After the marinade in the pickle juice, a good season and then a brief sear in a super hot pan, make sure you slice the meat thinly across the grain, you will be rewarded with tender bites perfect for these Dill Pickle Beef Skewers. Pour the pickle juice into a shallow small tupperware. Peel and thinly slice the red onion and add it to the pickle juice. Season the juice with a little black pepper and then add your steak. 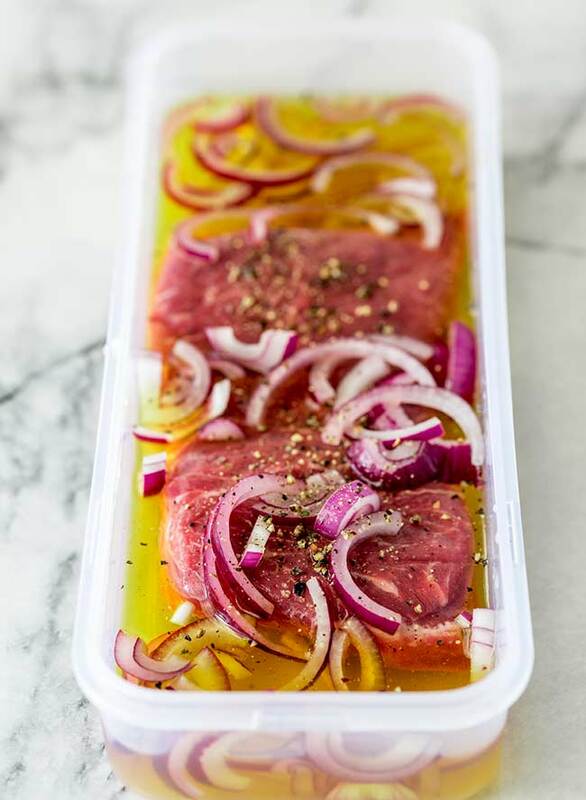 Seal the tupperware and marinade for 3-5 hours. Place a heavy based fry pan over a medium high heat and let it get hot. Rub the steak wth the oil and then season lightly with salt. Flash fry the steak for 2 minutes on each side and then set aside to rest under a tent of foil. Cut your mini pickles in half. Thinly slice your beef across the grain and then cut each slice in half. Skewer a small piece of beef and half a dill pickle onto a cocktail stick or small skewer. Serve with a pot of sweet mustard and a garnish of fresh dill. I think pickles divide people ( a bit like marmite) you either love them or hate them. Do you know anyone who is just ambivalent to them?? I am a BIG pickle lover!!! A chunk of cheese, a wedge of bread and plenty of pickles….that is the lunch that dreams are made of! At 33 weeks I started being able to eat, I was still very ill, but it was no longer linked to my eating! Pickles were a big part of every meal! Then with Mr 7, I didn’t lose my appetite but I think I ate a jar of pickles every single day!!! I always had a jar of pickles on my desk and I would take a jar and a fork to staff meetings! So I am very excited to bring you this appetizer. It is a favorite of mine and one I wasn’t sure anyone else would enjoy. But having had 4 different people have asked me for the recipe, so I felt it was time to share my pickle passion with the world. 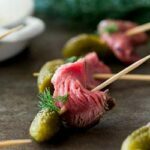 If you love food why not subscribe to my newsletter, I will drop you an email every now and then, just to say hi and send you a couple of recipes think you might love, like these dill pickle beef skewers. Hi! I made this once already as a test and loved it! I want to make it for a football party on Sunday (Today is Wednesday) – do you think if I made it on Friday it would be ok for the Sunday 2 days later? Thank you! I have never kept them that long and I am wondering if the pickle would start to turn the beef a bit mushy. I would suggest marinading and cooking the beef in advance and then storing it in the fridge whole. That way you can slice and assemble on Sunday morning before your party.